Hello, did everyone have a lovely week? It was another beautiful Sunday morning here in NL, the sun was shining, a warm day, and the colors were just amazing. We had decided to do some grocery shopping as the supermarkets here are opened on Sundays. But first things first, Charlie needed to be walked, during the weekends my husband does the walking, I on the other hand make breakfast job of make a delicious breakfast and some coffee. 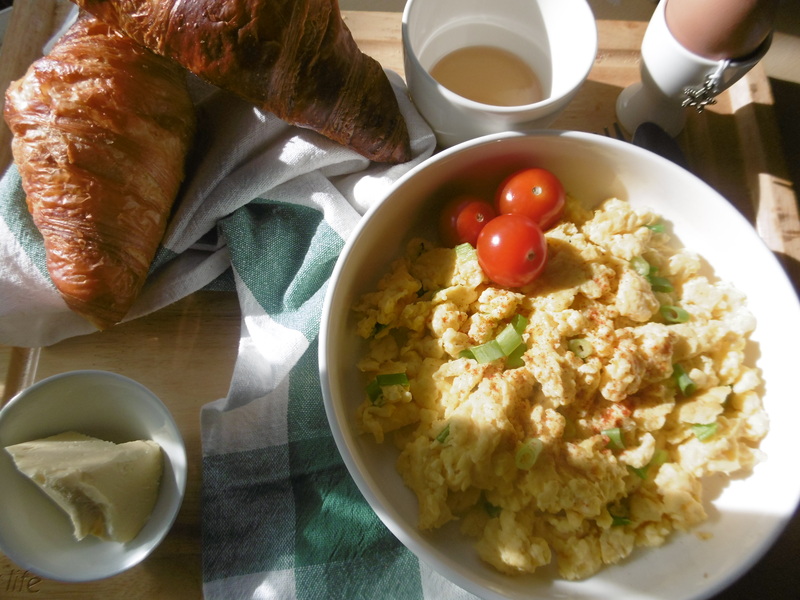 I know that most know how to make scrambled eggs, but there are others who are just starting to cook, so what better way than to start with Scrambled Eggs. 🙂 Have you ever tried adding in some fresh Scallions or Chives, Parmesan Cheese and Sweet Paprika? If not you should try out this recipe. In a large skillet add in butter. Pour into egg mix milk, heavy cream, salt, sweet paprika, parmesan cheese. Stir slowly, toss in the scallions and continue to stir until eggs are done. Ok so that means I need to go to Luda first in Florida and then come to you in AZ....wouldn't that be FANTASTIC!!! Come make it for me !! !